Three University of Ulster students, who successfully completed the Step-Up programme, have been awarded £1,000 scholarships by The Honourable The Irish Society. The Step-Up initiative is a unique and innovative interventionist programme, which provides new learning opportunities in science for talented young people who live in areas of social and economic disadvantage. 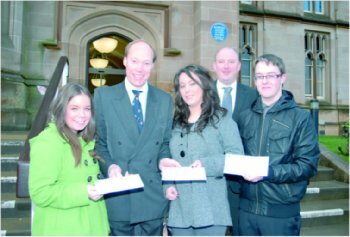 Applicants eligible to apply for the scholarships were first year students who had graduated from the University of Ulster’s Step-Up programme in August 2010. A Scholarship Committee, which consisted of representatives from the University of Ulster, Step-Up schools and industrial partners, then selected the three top entries. The successful candidates were Adult Nursing student Patrice Williams (formerly of St. Mary’s College, Londonderry), Psychology student Michelle Devlin (formerly St. Cecilia’s College, Londonderry) and Biomedical Science student Christopher McLaughlin (formerly St. Brigid’s College, Londonderry). All three applicants fought off strong competition to obtain the scholarships which will help to support their academic studies. Mr Edward Montgomery of The Honourable The Irish Society said: “We are delighted to facilitate scholarship support for the three successful students. The Step-Up programme, which is now in its eleventh year, continues to go from strength to strength in what is currently a challenging economic and educational environment”. CAPTION: receiving their awards are front (left to right): Patrice Williams, with Edward Montgomery, The Honourable The Irish Society, Michelle Devlin and Christopher McLaughlin. Back: Dr Damian O'Kane, Head of Access and Educational Partnerships, University of Ulster.